Thanks so much for sharing this with me – looks awesome!! 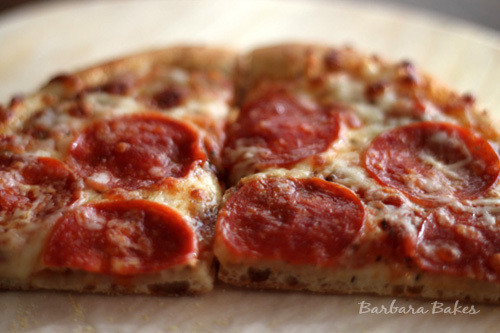 The perfect pizza. Just beautiful, Barbara! I’ve always made made homemade pizza, which I find WAY tastier, cheaper, and less hassle than than popping by the pizza place for take-away. It’s also a great way to use up odd bits and bobs of veggies, cheese, and sausage. Your pizza sauce looks sensational, and I’ll definitely give it a whirl. I love making pizza at home and do every Friday night. But I really do need a good homemade sauce. Thanks, Barbara! 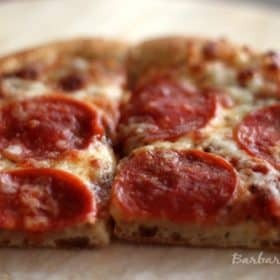 Kristy – I haven't tried the Fleischman's pizza yeast yet. I'll have to look for it. Let me know if you give it a try. I went to a party once where everyone was given a slab of rolled out dough and could put whatever ingredients on their pizza they wanted. I thought this was fabulous, but of course, we couldn't all eat together because they only had one oven and couldn't get all the individual pizzas in. I still thought it was a fun idea!